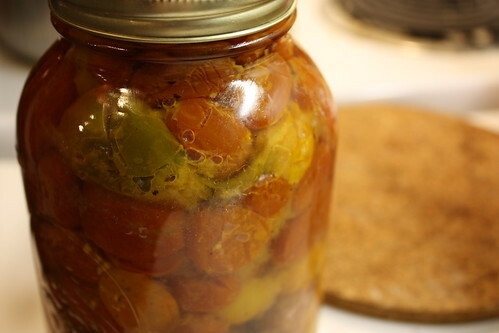 Daring Cooks September: Food Preservation | Mmm, Tasty! Ok, let’s be honest right from the first paragraph here: I didn’t do the challenge exactly as John wrote it, but I think he’ll forgive me. See, I’ve only done a bit of canning before, and it had been a while, so I didn’t really remember all the rules, other than the general food safety stuff. Since I wasn’t an experienced canner/food preserver, I was supposed to make one of three recipes: apple butter, bruschetta, or roasted tomatoes with garlic and basil. But as you will see, I didn’t make any of those things. A few weekends ago I got together with my friend Carole and did a bunch of canning with her. We canned corn and roasted tomatoes (with just oil and salt). I took home about a half dozen of the jars and have used most of them since. Then, real lifetm attacked. Rich and I both have a lot of commitments outside the house in the coming months (starting, err, tomorrow! ), to the point where there are some weeks we won’t be able to cook dinner at home at all. Well, not unless we want to be eating at 10 or 11pm! So I knew I had to start making some meals ahead that we could easily grab and reheat at home (or on the run). Suddenly making apple butter just didn’t fit into my schedule. The last two weeks have been spent making a lot of different things: vegan chili, corn soup, squash/corn/chipotle soup, and several types of muffins. I started to can up some of the soup and quickly realized there was no where to store it. 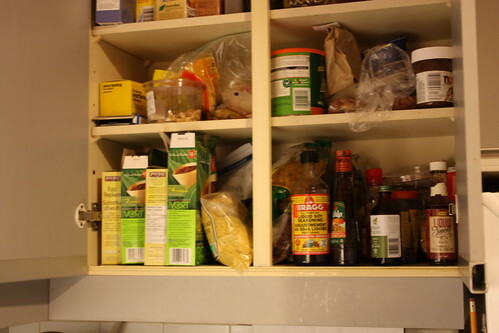 Seriously, have you seen my cupboards? There isn’t room for a bunch of big jars of soup! So instead, I tossed them all into my freezer. 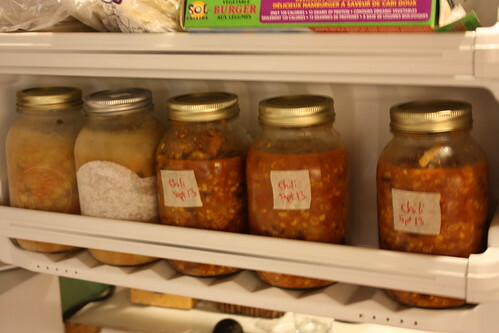 You can freeze jars of soup or chili, providing you let them cool completely before doing so (to help reduce ice crystal formation) and you leave an inch or two of space at the top of the jar, to allow for expansion (due to freezing). I have had tons of room in the freezer, so this plan worked really well. 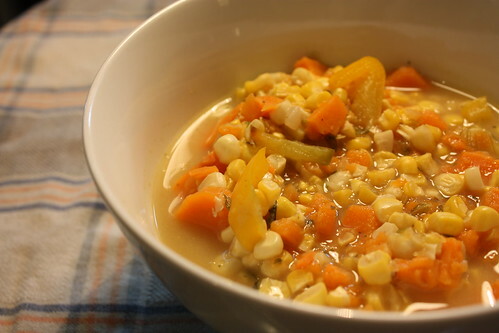 The corn soup you see pictured above is a jae steele recipe, from her book Ripe From Around Here. The chili isn’t really much of a recipe: in a large pot, saute up one diced onion until softened, then toss in a few minced cloves of garlic. Cook for a few minutes, then add in a 19 oz can of kidney beans, black beans and two large cans of diced tomatoes. Dump in some chili powder, chopped chipotle peppers and cumin to taste. Add in corn (an entire jar in my case!) and stir everything super well to let the flavours meld. Cook for 20 minutes or so, then taste and adjust seasonings. Done. The squash soup is based on a recipe from FatFree Vegan Kitchen. I’ve posted it with my modifications below, but the kudos go to Susan for the original idea! 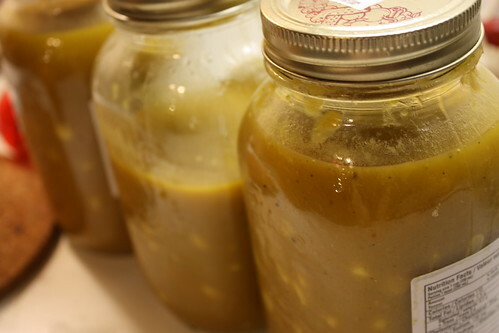 Oh and ignore the nutrition label on the jar in the picture… I really did make this soup, I just reused an old jar. Saute the onion over medium heat in a large pot until browned, about 5 minutes or so. Add in the garlic and ginger and cook for another minute or two, then add in the chipotle, squash, sweet potato and broth. Lower your heat to medium-low and cook until both the squash and sweet potato are tender, 20-30 minutes. If you need to, add a bit of water to the pot periodically to make sure the liquid level remains the same. Once your squash and sweet potato are cooked, add in the curry powder and non-dairy milk. Then, grab your trusty hand blender and puree the soup until smooth (be careful not to let it splash on you!). Add salt and pepper to taste, and a bit more curry powder and/or chipotle if you feel it needs the extra kick. Last but never least, add in your corn kernels and cook until tender, about 3 minutes or so. I certainly had fun jarring up all that stuff, and I hope some of you who have never really tried prepping food ahead will try freezing or canning – it really is pretty easy and will make eating healthy meals a whole lot easier when you barely have time to think! To check out more of what my fellow Daring Cooks did with this month’s challenge, just visit the Daring Kitchen.